Preheat oven to 400 degrees. 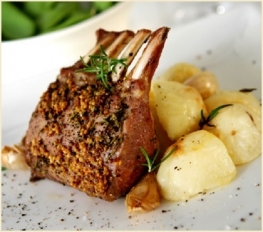 Cut fat off rack of lamb and remove sheen layer for maximum tenderness. Mix horseradish and dijon mustard together and spread over lamb. Line baking pan with aluminum foil for easy clean up. Bake for 20 minutes or until Lamb meat is medium rare. Add fresh ground pepper to taste.